This article is about the British national museum organisation. For other uses, see Imperial War Museum (disambiguation). Imperial War Museums (IWM) is a British national museum organisation with branches at five locations in England, three of which are in London. Founded as the Imperial War Museum in 1917, the museum was intended to record the civil and military war effort and sacrifice of Britain and its Empire during the First World War. The museum's remit has since expanded to include all conflicts in which British or Commonwealth forces have been involved since 1914. As of 2012, the museum aims "to provide for, and to encourage, the study and understanding of the history of modern war and 'wartime experience'." 10,700,000 items or collections of items. Originally housed in the Crystal Palace at Sydenham Hill, the museum opened to the public in 1920. In 1924, the museum moved to space in the Imperial Institute in South Kensington, and finally in 1936, the museum acquired a permanent home that was previously the Bethlem Royal Hospital in Southwark. The outbreak of the Second World War saw the museum expand both its collections and its terms of reference, but in the post-war period, the museum entered a period of decline. The 1960s saw the museum redevelop its Southwark building, now referred to as Imperial War Museum London, which serves as the organization's corporate headquarters. During the 1970s, the museum began to expand onto other sites. The first, in 1976, was a historic airfield in Cambridgeshire now referred to as IWM Duxford. In 1978, the Royal Navy cruiser HMS Belfast became a branch of the museum, having previously been preserved for the nation by a private trust. In 1984, the Cabinet War Rooms, an underground wartime command centre, was opened to the public. From the 1980s onwards, the museum's Bethlem building underwent a series of multimillion-pound redevelopments, completed in 2000. Finally, 2002 saw the opening of IWM North in Trafford, Greater Manchester, the fifth branch of the museum and the first in the north of England. In 2011, the museum rebranded itself as IWM, standing for "Imperial War Museums". 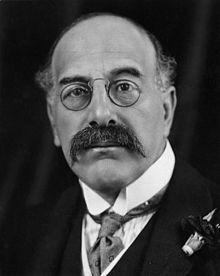 On 27 February 1917 Sir Alfred Mond, a Liberal MP and First Commissioner of Works, wrote to the Prime Minister David Lloyd George to propose the establishment of a National War Museum. This proposal was accepted by the War Cabinet on 5 March 1917 and the decision announced in The Times on 26 March. A committee was established, chaired by Mond, to oversee the collection of material to be exhibited in the new museum. This National War Museum Committee set about collecting material to illustrate Britain's war effort by dividing into subcommittees examining such subjects as the Army, the Navy, the production of munitions, and women's war work. There was an early appreciation of the need for exhibits to reflect personal experience in order to prevent the collections becoming dead relics. Sir Martin Conway, the Museum's first Director General, said that exhibits must 'be vitalised by contributions expressive of the action, the experiences, the valour and the endurance of individuals'. The museum's first curator and secretary was Charles ffoulkes, who had previously been curator of the Royal Armouries at the Tower of London. In July 1917 Mond made a visit to the Western Front in order to study how best to organise the museum's growing collection. While in France he met French government ministers, and Field Marshal Haig, who reportedly took great interest in his work. In December 1917 the name was changed to the Imperial War Museum after a resolution from the India and Dominions Committee of the museum. The museum was opened by King George V at the Crystal Palace on 9 June 1920. During the opening ceremony, Sir Alfred Mond addressed the King on behalf of the committee, saying that 'it was hoped to make the museum so complete that every one who took part in the war, however obscurely, would find therein an example or illustration of the sacrifice he or she made' and that the museum 'was not a monument of military glory, but a record of toil and sacrifice'. Shortly afterwards the Imperial War Museum Act 1920 was passed and established a Board of Trustees to oversee the governance of the museum. To reflect the museum's Imperial remit the board included appointees of the governments of India, South Africa, Canada, Australia and New Zealand. While the Act was being debated, some Parliamentarians felt that the museum would perpetuate an undesirable war spirit and Commander Joseph Kenworthy MP said that he would 'refuse to vote a penny of public money to commemorate such suicidal madness of civilisation as that which was shown in the late War'. On the August Bank Holiday 1920, the first public holiday since the museum's opening, 94,179 visitors were received, and by November 1921, 2,290,719 had visited the museum. In 1924 the museum moved to the Imperial Institute building (demolished in the 1950s and 1960s to make way for Imperial College) in South Kensington. While this location was more central and in a prestigious area for museums, the accommodation itself proved cramped and inadequate and in 1936 a new permanent location was found south of the River Thames in Southwark. The building, designed by James Lewis was the former Bethlem Royal Hospital which had been vacated following the hospital's relocation to Beckenham in Kent. The site was owned by Lord Rothermere, who had originally intended to demolish the building entirely in order to provide a public park in what was a severely overcrowded area of London. Eventually the central portion of the hospital building was retained while its two extensive wings were removed and the resulting space named Geraldine Mary Harmsworth Park, after Lord Rothermere's mother. Sir Martin Conway described the building as '...a fine building, really quite noble building, with a great portico, a distinguishing dome, and two great wings added to it for the accommodation of lunatics no longer required. This particular building can be made to contain our collection admirably, and we shall preserve from destruction quite a fine building which otherwise will disappear'. The 'distinguishing dome' was added by Sydney Smirke in 1846 and housed the hospital's chapel. The museum was reopened by the Duke of York (later King George VI) in its new accommodation on 7 July 1936. With the outbreak of the Second World War in 1939, the museum began to collect material documenting the conflict. In November 1939, during the so-called 'Phoney War', the museum appeared in the opening sequence of the GPO Film Unit production The First Days, in which children are seen playing on some of the museum's German artillery pieces captured during the First World War. With the evacuation of British forces from Dunkirk in May/June 1940, however, the British Army's shortage of equipment saw eighteen of the museum's artillery pieces return to military service. The museum's trench clubs were used by the Home Guard, while other items such as sights and optical instruments were returned to the Ministry of Supply. The museum refused, however, to return some historic items such as a naval gun from HMS Lance (which had fired Britain's first shot of the First World War) or a gun served by Victoria Cross-winning boy seaman Jack Cornwell. The museum initially remained open but was closed for the duration of the war in September 1940 with the onset of the Blitz. On 31 January 1941 the museum was struck by a Luftwaffe bomb which fell on the naval gallery. A number of ship models were damaged by the blast and a Short Seaplane, which had flown at the Battle of Jutland, was destroyed. While closed to the public the museum's building was used for a variety of purposes connected to the war effort, such as a repair garage for government motor vehicles, a centre for Air Raid Precautions civil defence lectures and a fire fighting training school. In October 1945 the museum mounted a temporary exhibition, the first since the end of the war in August, which showcased technologies developed by the Petroleum Warfare Department. These included the submarine fuel pipeline PLUTO, the fog dispersal method FIDO, and flame weapons such as the Churchill Crocodile and Wasp Universal Carrier. However, due to bomb damage to both the building and exhibits, the museum was obliged to reopen its galleries piecemeal. The museum reopened a portion of its galleries in November 1946. A third of the galleries were opened in 1948 and a further wing opened in 1949. In 1953, with Commonwealth forces engaged in Korea and Malaya the museum began its current policy of collecting material from all modern conflicts in which British or Commonwealth forces were involved. However, despite this expansion of remit, the early postwar period was a period of decline for the museum. Dr Noble Frankland, the museum's Director from 1960 to 1982, described the museum's galleries in 1955 as appearing 'dingy and neglected [and in a] dismal state of decay' the museum's 'numerous stunning exhibits' notwithstanding. In 1966 the Museum's Southwark building was extended to provide collections storage and other facilities, the first major expansion since the Museum had moved to the site. The development also included a purpose-built cinema. 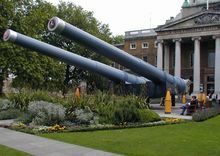 In 1967 the museum acquired a pair of 15-inch naval guns. One had been mounted on the Royal Navy's HMS Ramillies and the other on both HMS Resolution and HMS Roberts. Both had been fired in action during the Second World War. They went on permanent display outside the museum in May 1968. The acquisition of these guns, representative of the dreadnought era of British battleships, led the museum to seek to acquire a 6-inch triple turret that would be representative of a number of classes of British cruisers. This would eventually lead to the preservation of the Royal Navy light cruiser HMS Belfast, which became a branch of the museum in 1978. Later in 1968 on 13 October the Museum was attacked by an arsonist, Timothy John Daly, who claimed he was acting in protest against the exhibition of militarism to children. He caused damage valued at approximately £200,000, not counting the loss of irreplaceable books and documents. On his conviction in 1969 he was sentenced to four years in prison. In 1969 RAF Duxford, a Royal Air Force fighter airfield in Cambridgeshire was declared surplus to requirements by the Ministry of Defence. Needing further space, the museum duly requested permission to use part of the site as temporary storage. The entire site was later transferred to the museum in February 1976 and Duxford, now referred to as Imperial War Museum Duxford became the museum's first branch. Also during the 1970s the government raised the possibility of the museum taking over the historic Cabinet War Rooms in Whitehall. The museum was reluctant due to its new commitments related to Duxford and HMS Belfast, but agreed in 1982. By 1983 the museum was again looking to redevelop the Southwark site and approached engineering firm Arup to plan a phased programme of works that would expand the building's exhibition space, provide appropriate environmental controls to protect collections, and improve facilities for visitors. The following year, in April 1984, the Cabinet War Rooms were opened to the public as a branch of the museum. The first phase of the works to the Southwark building started in 1986 and were completed in 1989, during which time the museum was closed to the public. The work included the conversion of what was previously the hospital's courtyard into a centrepiece Large Exhibits Gallery. This gallery featured a strengthened ground floor (to support the weight of very heavy exhibits), a first floor mezzanine and second storey viewing balcony. Into this space were placed tanks, artillery pieces, vehicles, ordnance and aircraft from the First World War to the Falklands War. For some years the museum was marketed as "The new Imperial War Museum". This atrium, with its concentration of military hardware, has been described as "the biggest boys' bedroom in London". This first phase cost £16.7 million (of which £12 million was provided by the government) and the museum was reopened by The Queen on 29 June 1989. The atrium in August 2009. Ground floor exhibits include: "Devil" a Mark V tank; "Ole Bill" an LGOC B-type bus, V-2 and Polaris missiles, 800 mm shell from Schwerer Gustav, and (sand-coloured, extreme right) a Grant tank used by Bernard Montgomery. Suspended aircraft include a Sopwith Camel, Heinkel He 162 and (partially obscured) Supermarine Spitfire number R/6915, which flew in the Battle of Britain and shot down three aircraft. In September 1992 the museum was the target of a Provisional Irish Republican Army attack against London tourist attractions. Two incendiary devices were found in a basement gallery, but were extinguished by staff before the arrival of the fire brigade, and caused only minor damage. The second stage of the redevelopment of the Southwark building, during which the museum remained open to the public, was completed in 1994. During the 1990s, while these works were going on, the museum was also seeking to open a branch in the north of England. 71 sites were offered for consideration by 36 local councils and in January 1999 the then Culture Secretary Chris Smith formally launched a project to construct a new branch of the museum, Imperial War Museum North, in Trafford, Greater Manchester. The following year, 2000, the final phase of the Southwark redevelopment was completed. The development included the installation of the museum's Holocaust Exhibition which was opened by the Queen on 6 June 2000. This was the first permanent exhibition dedicated to the Holocaust in a UK museum; its development had taken five years at a cost of £5 million. Two years later, in July 2002, Imperial War Museum North was opened. Between 2004 and 2010 the museum was a partner in a national learning project entitled "Their Past Your Future" (TPYF), part of the Big Lottery Fund's Veterans Reunited programme to commemorate the 60th anniversary of the end of the Second World War. A partnership between the IWM, the Museums, Libraries and Archives Council, and Scottish, Northern Irish and Welsh museum authorities, phase one included a touring exhibition seen by more than two million people, overseas educational visits and further activities run by local authorities. A second phase took a wider 20th century historical remit; it comprised a learning programme using overseas visits and social media, and a professional development scheme for educators. A digital archive of the project, online exhibitions and learning resources were also produced. In October 2011 the museum rebranded itself as Imperial War Museums, the initials IWM forming the basis of a new corporate logo. In September 2011 the museum secured funding from NESTA, the Arts and Humanities Research Council and Arts Council England to develop "social interpretation" systems to allow visitors to comment on, collect, and share museum objects via social media. These systems were incorporated in "A Family in Wartime", an exhibition at IWM London depicting British family life during the Second World War, which opened in April 2012. In August 2009 the Museum announced the creation of the Imperial War Museum Foundation. Chaired by Jonathon Harmsworth the foundation was charged with raising funds to support the redevelopment of Imperial War Museum London's permanent galleries. In December 2010 plans were announced to redevelop IWM London's First World War gallery in time for the conflict's centenary in 2014, and Prince William, Duke of Cambridge became the foundation's patron. In a speech at IWM London on 11 October 2012, Prime Minister David Cameron announced an additional £5 million of government funding to support the museum's redevelopment, as part of funding arrangements to facilitate national centenary commemorations. The £40 million redevelopment, designed by Foster and Partners, provides new gallery spaces dedicated to the history of the First World War, a new central hall, easier navigation and improved visitor facilities, access and circulation. In preparation for building work, a number of galleries were closed during September 2012, and by December 2012 over sixty large objects had been removed from the IWM London atrium for conservation at Duxford. To allow building work to go ahead, IWM London closed to the public on 2 January 2013. The museum partially reopened on 29 July 2013. IWM London was formally reopened on 17 July 2014 by Prince William, Duke of Cambridge. The new atrium, July 2014. The exhibits include a Supermarine Spitfire, a V-1 flying bomb, a V-2 rocket, a Harrier Jump Jet, and Jeremy Deller's Baghdad, 5 March 2007, the wreckage of a car destroyed by a bomb during the Iraq War. From the 1970s onwards the Imperial War Museum began to expand onto other sites. The first branch, Imperial War Museum Duxford opened to the public on a regular basis in June 1976. 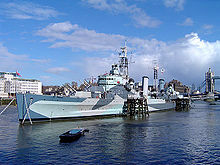 HMS Belfast became a branch of the museum in 1978. The Cabinet War Rooms opened in 1984, and Imperial War Museum North in 2002. The museum has occupied the former Bethlem Royal Hospital on Lambeth Road since 1936. The hospital building was designed by the hospital surveyor, James Lewis, from plans submitted by John Gandy and other architects, and construction completed in October 1814. 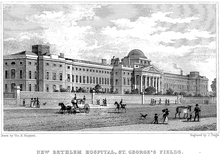 The hospital consisted of a range of buildings 580 feet long with a basement and three storeys, parallel to Lambeth Road, with a central entrance under a portico. The building was substantially altered in 1835 by architect Sydney Smirke. In order to provide more space, he added blocks at either end of the frontage, and galleried wings on either side of the central portion. He also added a small single-storey lodge, still in existence, at the Lambeth Road gate. Later, between 1844–46, the central cupola was replaced with a copper-clad dome in order to expand the chapel beneath. The building also featured a theatre in a building to the rear of the site. The building remained substantially unchanged until vacated by the hospital in 1930. 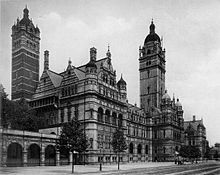 After the freehold was purchased by Lord Rothermere, the wings were demolished to leave the original central portion (with the dome now appearing disproportionately tall) and Smirke's later wings. When the museum moved into the building in 1936 the ground floor of the central portion was occupied by the principal art gallery, with the east wing housing the Naval gallery and the west wing the Army gallery. The Air Force gallery was housed in the former theatre. The first floor comprised further art galleries (including rooms dedicated to Sir William Orpen and Sir John Lavery), a gallery on women's war work, and exhibits relating to transport and signals. The first floor also housed the museum's photograph collection. The second floor housed the museum's library in its west wing, and in the east wing the map collection and stored pictures and drawings. This division of exhibits by service, and by civil or military activity, persisted until a wide-ranging redisplay of the galleries from the 1960s onwards. In September 1972 the building received Grade II listed building status. The original hospital building is now largely occupied by corporate offices. The 1966 extension houses the library, art store, and document archives while the 1980s redevelopments created exhibition space over five floors. The first stage created 8,000 m2 of gallery space of which 4,600 m2 was new, and the second provided a further 1,600 m2. The final phase, the Southwest Infill, was partly funded by a £12.6 million grant from the Heritage Lottery Fund and provided 5,860m2 of gallery space and educational facilities over six floors. Before the 2013-14 redevelopment, the basement was occupied by permanent galleries on the First and Second World Wars, and of conflicts after 1945. The ground floor comprised the atrium, cinema, temporary exhibition spaces, and visitor facilities. The first floor included the atrium mezzanine, education facilities, and a permanent gallery, Secret War, exploring special forces, espionage and covert operations. The second floor included the atrium viewing balcony, two art galleries, a temporary exhibition area and the permanent Crimes against Humanity exhibition. The third floor housed the permanent Holocaust Exhibition, and the fourth floor, a vaulted roof space, accommodated the Lord Ashcroft Gallery. Opened in November 2010 the gallery exhibits the museum's Victoria Cross (VC) and George Cross collection, alongside the private VC collection amassed by Michael Ashcroft, 241 medals in total. In 1989 the museum acquired the All Saints Annexe, a former hospital building in Austral Street off West Square. The 1867 building, which backs onto Geraldine Mary Harmsworth Park, was originally an orphanage opened by local philanthropist Charlotte Sharman, then later used as a hospital. It houses the museum's photographic, film and sound archives, and offices. Imperial War Museum Duxford, near the village of Duxford in Cambridgeshire, is Britain's largest aviation museum. Duxford houses the museum's large exhibits, including nearly 200 aircraft, military vehicles, artillery and minor naval vessels in seven main exhibitions buildings. The site also provides storage space for the museum's collections of film, photographs, documents, books and artefacts. The site accommodates a number of British Army regimental museums, including those of the Parachute Regiment and the Royal Anglian Regiment. Based on the historic Duxford Aerodrome, the site was originally operated by the Royal Air Force (RAF) during the First World War. During the Second World War Duxford played a prominent role during the Battle of Britain and was later used by United States Army Air Forces fighter units in support of the daylight bombing of Germany. Duxford remained an active RAF airfield until 1961. Many of Duxford's original buildings, such as hangars used during the Battle of Britain, are still in use. A number of these buildings are of architectural or historic significance and over thirty have listed building status. The site also features a number of purpose-built exhibition buildings, such as the Stirling Prize-winning American Air Museum, designed by Sir Norman Foster. The site remains an active airfield and is used by a number of civilian flying companies, and hosts regular air shows. The site is operated in partnership with Cambridgeshire County Council and the Duxford Aviation Society, a charity formed in 1975 to preserve civil aircraft and promote appreciation of British civil aviation history. HMS Belfast, a Town class cruiser, was launched in 1938 and served throughout the Second World War, participating in the December 1943 Battle of North Cape and firing some of the first shots of Operation Overlord, the Allied invasion of Normandy in June 1944. She saw further combat in the Korean War. Expected to be disposed of as scrap after she was decommissioned in 1963, in 1967 efforts were initiated to preserve Belfast as a museum ship. A joint committee of the Imperial War Museum, the National Maritime Museum and the Ministry of Defence was established, and reported in June 1968 that preservation was practical. In 1971 the government decided against preservation, prompting the formation of the private HMS Belfast Trust to campaign for her to be saved for the nation. The Trust was successful in its efforts, and the government transferred the ship to the Trust in July 1971. Brought to London, she was moored on the River Thames near Tower Bridge in the Pool of London. Opened to the public in October 1971 Belfast became a branch of the Imperial War Museum on 1 March 1978, being acknowledged by the then Secretary of State for Education and Science, Shirley Williams, as "a unique demonstration of an important phase of our history and technology". In service for 24 years HMS Belfast was in Frankland's opinion, capable of representing "a whole generation of [historical evidence]". In 2017, the name of the exhibit was changed to "HMS Belfast 1938" to reflect that one of the Royal Navy's new Type 26 frigates had been given the name HMS Belfast. The Cabinet War Rooms is an underground complex that served as a British government command centre throughout the Second World War. Located beneath the Treasury building in the Whitehall area of Westminster, the facilities became operational in 1939 and were in constant use until their abandonment in August 1945 after the surrender of Japan. Their historical value was recognised early on, and the public were able to visit by appointment. However, the practicalities of allowing public access to a site beneath a working government office meant that only 4,500 of 30–40,000 annual applicants to visit the War Rooms could be admitted. The museum agreed to take over the administration of the site in 1982, a development keenly supported by the then Prime Minister Margaret Thatcher, an admirer of Britain's wartime Prime Minister Winston Churchill. Thatcher opened the War Rooms in April 1984. In 2003 a further suite of rooms, used as accommodation by Churchill, his wife and close associates, were added to the museum. The restoration of these rooms, which since the war had been stripped out and used for storage, cost £7.5 million. In 2005 the War Rooms were rebranded as the Churchill Museum and Cabinet War Rooms, with 850 m2 of the site redeveloped as a biographical museum exploring Churchill's life. The development of the Churchill Museum cost a further £6 million. The centrepiece is a 15m interactive table which enables visitors to access digitised material, particularly from the Churchill Archives Centre, via an "electronic filing cabinet". The museum was renamed the Churchill War Rooms in 2010. The Imperial War Museum North was opened in Trafford, Greater Manchester in 2002. It was the first branch of the museum outside southeast England, and the first to be purpose-built as a museum. Designed by architect Daniel Libeskind, Imperial War Museum North was his first building in Britain. Libeskind's building, overlooking the Manchester Ship Canal at Salford Quays, was based on the concept of a globe shattered by conflict into shards and reassembled. These shards, representing earth, air and water, give the building its shape. Originally budgeted at £40 million, the museum was eventually completed for £28.5 million after anticipated funding was not forthcoming. The museum was funded by local, national and European development agencies, by private donations and by Peel Holdings, a local transport and property company which contributed £12.5 million. The museum's first floor main gallery space houses the permanent exhibitions. These consist of a chronological display which runs around the gallery's 200m perimeter and six thematic displays in "silos" within the space. The walls of the gallery space are used as screens for the projection of an hourly audiovisual presentation, the Big Picture. The main gallery, described as cavernous and dramatic, includes objects such as a Russian T-34 tank, a United States Marine Corps AV-8A Harrier jet, and a British 13-pounder field gun which fired the British Army's first shot of the First World War. The museum also hosts a programme of temporary exhibitions, mounted in a separate gallery. See also: Category:Collection of the Imperial War Museum. The museum's collection includes this photograph of Montgomery in his tank along with the tank itself, his command caravans and staff car, and his papers. The Imperial War Museum's original collections date back to the material amassed by the National War Museum Committee. The present departmental organisation came into being during the 1960s as part of Frankland's reorganisation of the museum. The 1970s saw oral history gain increasing prominence and in 1972 the museum created the Department of Sound Records (now the Sound Archive) to record interviews with individuals who had experienced the First World War. The museum maintains an online database of its collections. The museum's documents archive seeks to collect and preserve the private papers of individuals who have experienced modern warfare. The archive's holdings range from the papers of senior British and Commonwealth army, navy and air officers, to the letters, diaries and memoirs of lower-ranked servicemen and of civilians. The collection includes the papers of Field Marshals Bernard Montgomery, and Sir John French. The archive also includes large collections of foreign documents, such as captured German Second World War documents previously held by the Cabinet Office Historical Section, Air Historical Branch and other British government bodies. The foreign collection also includes captured Japanese material transferred from the Cabinet Office. The collection also includes files on Victoria and George Cross recipients, and correspondence relating to the BBC documentary The Great War. The documents collection also includes the UK National Inventory of War Memorials. In 2012 the museum reported its documents collection to contain 24,800 collections of papers. The museum's art collection includes paintings, prints, drawings, sculpture, and works in film, photography and sound. The collection originated during the First World War, when the museum acquired works that it had itself commissioned, as well as works commissioned by the Ministry of Information's British War Memorials Committee. As early as 1920 the art collection held over 3,000 works and included pieces by John Singer Sargent, Wyndham Lewis, John Nash and Christopher Nevinson. Notable First World War works include Sargent's Gassed and other works commissioned for an, unbuilt, Hall of Remembrance. The collection expanded again after the Second World War, receiving thousands of works sponsored by the Ministry of Information's War Artists' Advisory Committee. In 1972 the museum established the Artistic Records Committee (since renamed the Art Commissions Committee) to commission artists to cover contemporary conflicts. Commissioned artists include Ken Howard, Linda Kitson, John Keane, Peter Howson, Steve McQueen (see Queen and Country) and Langlands & Bell, responding to conflicts in Northern Ireland, the Falklands, the Persian Gulf, Bosnia, Iraq and Afghanistan. The collection also includes over twenty thousand items of publicity material such as posters, postcards, and proclamations from both world wars, and more recent material such as posters issued by anti-war organisations such as the Campaign for Nuclear Disarmament and the Stop the War Coalition. The museum's collection is represented in digital resources such as the Visual Arts Data Service (VADS), and Google Art Project. In 2012 the museum reported the total size of its art collection as 84,980 items. A still from The Battle of the Somme, preserved by the museum's film archive. The museum's Film and Video Archive is one of the oldest film archives in the world. The archive preserves a range of historically significant film and video material, including the official British film record of the First World War. Notable among the archive's First World War holdings is The Battle of the Somme, a pioneering 1916 documentary film (which was inscribed on the UNESCO Memory of the World register in 2005), and Der Magische Gürtel, a German 1917 propaganda film about the submarine U-35. The archive's Second World War holdings include unedited film shot by British military cameramen, which document combat actions such as the British landings on D-Day in June 1944, and the liberation of the Bergen-Belsen concentration camp in April 1945. The archive also holds government information films and propaganda features such as Target for Tonight and Desert Victory. The archive's post-Second World War collections include material from the Korean War, Cold War material, the former film library of NATO, and material produced by the United Nations UNTV service in Bosnia. As an official repository under the 1958 Public Records Act, the archive continues to receive material from the Ministry of Defence. The archive also seeks to acquire amateur film taken by both service personnel and civilian cameramen. Material from the collection was used in the production of TV documentary series such as The Great War and The World at War. In 2012 the museum reported the size of its film archive as being in excess of 23,000 hours of film, video and digital footage. The museum's Photograph Archive preserves photographs by official, amateur and professional photographers. The collection includes the official British photographic record of the two world wars; the First World War collection includes the work of photographers such as Ernest Brooks and John Warwick Brooke. The archive also holds 150,000 British aerial photographs from the First World War, the largest collection of its kind. The Second World War collection includes the work of photographers such as Bill Brandt, Cecil Beaton and Bert Hardy. Like the Film Archive, the Photograph Archive is an official repository under the 1958 Public Records Act, and as such continues to receive material from the Ministry of Defence. In 2012 the museum reported the size of its photographic holdings as approximately 11 million images in 17,263 collections. The museum's exhibits collection includes a wide range of objects, organised into numerous smaller collections such as uniforms, badges, insignia and flags (including a Canadian Red Ensign carried at Vimy Ridge in 1917, a Union flag from the 1942 British surrender of Singapore, and another found among the wreckage of the World Trade Center following the September 11 attacks); personal mementoes, souvenirs and miscellanea such as trench art; orders, medals and decorations (including collections of Victoria and George Crosses); military equipment; firearms and ammunition, ordnance, edged weapons, clubs (such as trench clubs) and other weapons, and vehicles, aircraft and ships. The museum holds the national collection of modern firearms. The firearms collection includes a rifle used by T. E. Lawrence, and an automatic pistol owned by Winston Churchill. The ordnance collection includes artillery pieces that participated in notable battles, such as the Néry gun, a field gun that was used during the 1914 action at Néry, and equipment captured from enemy forces. The museum's vehicles collection includes Ole Bill, a bus used by British forces in the First World War, and a number of vehicles used by Field Marshal Montgomery during the Second World War. The museum's aircraft collection includes aircraft that are notable for their rarity, such as the only complete and original Royal Aircraft Factory R.E.8 in existence and one of only two surviving TSR-2 strike aircraft, and aircraft associated with particular actions, such as a Supermarine Spitfire flown during the Battle of Britain. The museum's naval collection includes HM Coastal Motor Boat 4 and a midget submarine HMS XE8. In 2012 the museum reported its exhibits collection to contain 155,000 objects and a further 357 vehicles and aircraft. The museum's library is a national reference collection on modern conflict, and holds works on all aspects of warfare, including regimental or unit histories (such as 789 rare German unit histories from the First World War), technical manuals, biographical material and works on war's social, cultural, economic, political and military aspects. The library also holds printed ephemera such as the Imperial War Museum Stamp Collection, leaflets and ration books, printed proclamations, newspapers, trench magazines (such the Wipers Times) and trench maps. In 2012 the museum reported its library collection to contain over 80,000 items of historic importance (such as maps, proclamations and rare books) and a further 254,000 items of reference material. The museum's Sound Archive holds 33,000 sound recordings, including a large collection of oral history recordings of witnesses to conflicts since 1914. The museum's sound collection originated in 1972 with the creation of the Department of Sound Records and the instigation of an oral history recording programme. The sound collection opened to the public in July 1977. The collection also includes recordings made by the BBC during the Second World War, actuality sound effects, broadcasts, speeches and poetry. As part of the museum's First World War centenary programme, the museum is producing Voices of the First World War, a podcast series drawing upon the museum's oral history recordings. In 2012 the museum reported the size of its sound collection as 37,000 hours. The IWM has an online database, listing the various items which make up the IWM Collections. In some cases, there are images of the item, or contemporary photos, which can be shared and reused under a Creative Commons Licence. The War Memorials Register is a database of known war memorials in the United Kingdom. Information material used in composition, the condition of the memorial, its address and coordinates with a satellite map plot are recorded for each of the memorials. There are over 70,000 memorials on the register. Whilst many memorials are commemorated to those who died in the First World War, the scope of the project is all conflicts. In 2014, IWM and online genealogy service provider Findmypast entered into a collaboration to launch the "Lives of the First World War" platform. During the centenary period, anyone could sign up for an account. Those who paid for a subscription had the ability to add records from Findmypast's collections. A number of sources (War Office medal index cards, Canadian Expeditionary Force attestations, Royal Navy service records etc.) had been used as seeding documents to create individual entries in the database. Each entry in the database - known as a Life Story - could have been further built up, so as to document when that person was born, when they died, family members etc. If a Life Story needed to be added, or a duplicate existed that needed to be merged, such activity was requested via a support forum manned by IWM volunteers. A user with a subscription had the ability to group Life Stories together into a "Community". This could be a grouping based around a ship's crew, a unit in the army, or the names of men and women buried in a given war cemetery. The Imperial War Museum is an executive non-departmental public body under the Department for Culture, Media and Sport, from which it receives financial support in the form of a grant-in-aid. The governance of the museum is the responsibility of a Board of Trustees, originally established by the Imperial War Museum Act 1920, later amended by the Imperial War Museum Act 1955 and the Museums and Galleries Act 1992 and other relevant legislation. The board comprises a president (currently Prince Edward, Duke of Kent) who is appointed by the sovereign, and fourteen members appointed in varying proportions by the Prime Minister, and the Foreign, Defence, and Culture Secretaries. Seven further members are Commonwealth High Commissioners appointed ex officio by their respective governments. As of January 2012 the Chairman of the Trustees is Sir Francis Richards and his deputy is Lieutenant-General Sir John Kiszely. Past chairmen have included Admiral Sir Deric Holland-Martin (1967–77), Admiral of the Fleet Sir Algernon Willis and Marshal of the Royal Air Force Sir John Grandy (trustee 1971–78, Chairman 1978–89). During the Second World War Grandy had commanded RAF Duxford, and was chairman during the planning of Duxford's American Air Museum, which opened in 1997. The museum's Director-General is answerable to the trustees and acts as accounting officer. Since 1917 the museum has had six directors. The first was Sir Martin Conway, a noted art historian, mountaineer and explorer. He was knighted in 1895 for his efforts to map the Karakoram mountain range of the Himalayas, and was Slade Professor of Fine Arts at the University of Cambridge from 1901 to 1904. Conway held the post of Director until his death in 1937, when he was succeeded by Leslie Bradley. Bradley had served in the First World War in the Middlesex Regiment before being invalided out in 1917. He later became acquainted with Charles ffoulkes, who invited him to join the museum where he was initially engaged in assembling the museum's poster collection. Bradley retired in 1960 and was succeeded by Dr Noble Frankland. Frankland had served as a navigator in RAF Bomber Command, winning a Distinguished Flying Cross. While a Cabinet Office official historian he co-authored a controversial official history of the RAF strategic air campaign against Germany. Frankland retired in 1982 and was succeeded by Dr Alan Borg who had previously been at the Sainsbury Centre for Visual Arts. In 1995 Borg moved to the Victoria and Albert Museum and was succeeded by Sir Robert Crawford, who had originally been recruited by Frankland as a research assistant in 1968. Upon Crawford's retirement in 2008 he was succeeded by Diane Lees, previously Director of the V&A Museum of Childhood. She was noted in the media as the first woman appointed to lead a British national museum. ^ Whitmore, Mark (letter to Frankie Roberto) (12 May 2008) WhatDoTheyKnow.com Total number of objects in the Imperial War Museum's collection. Retrieved 28 October 2009. ^ Imperial War Museums. "About us". iwm.org.uk. Retrieved 28 August 2012. ^ "Imperial War Museum London". Museums - The World Museums Network. ^ Kavanagh, Gaynor (January 1988). "Museum as Memorial: The origins of the Imperial War Museum". Journal of Contemporary History. 23 (1): 77–97 . doi:10.1177/002200948802300105. ISSN 0022-0094. JSTOR 260869. ^ Kavanagh, Gaynor (1994). Museums and the First World War. Continuum International Publishing Group. p. 137. ISBN 0-7185-1713-X. Retrieved 30 January 2012. ^ a b Office of Public Sector Information Revised Statute from The UK Statute Law Database: Imperial War Museum Act 1920 (c.16). Retrieved 14 April 2010. ^ Hansard, 12 April 1920 Imperial War Museum Bill HC Deb 12 April 1920 vol 127 cc1465-9 Hansard 1803–2005 Accessed 22 March 2009. ^ Their Past Your Future. "Learning Resources for Teaching History – Key Stages 3 and 4 – The Imperial War Museum" (PDF). Imperial War Museum. Retrieved 18 March 2011. ^ Conway was addressing the House of Lords and his words recorded in Hansard. Quoted in Cooke, Steven; Jenkins, Lloyd (December 2001). "Discourses of Regeneration in Early Twentieth-Century Britain: From Bedlam to the Imperial War Museum". Area. Blackwell Publishing for The Royal Geographical Society. 33 (4): 382–390 . doi:10.1111/1475-4762.00044. ISSN 0004-0894. JSTOR 20004179. ^ Alberto Cavalcanti (director)/GPO Film Unit (November 1939). "the FIRST DAYS". Imperial War Museum Collection Search. Imperial War Museum. Retrieved 12 October 2012. ^ a b Charman, Terry (2008). A Museum of Man's Greatest Lunatic Folly: The Imperial War Museum and its Commemoration of the Great War 1917–2008 in A Part of History: Aspects of the British Experience of the First World War. London: Continuum. p. 103. ISBN 978-0-8264-9813-7. ^ Imperial War Museum. "Reopening of the Imperial War Museum, London after the Second World War 1946 (D 29420, caption)". archive.iwm.org.uk. Retrieved 1 April 2013. ^ Imperial War Museum. "Naval guns, 15-inch". archive.iwm.org.uk. Retrieved 25 February 2012. ^ Wingate, John (2004). In Trust for the Nation: HMS Belfast 1939–1972. London: Imperial War Museum. p. 101. ISBN 1-901623-72-6. ^ Frankland, Noble (1999). History at War. London: Giles de la Mare. pp. 205–208. ISBN 978-1-900357-10-4. ^ a b c d Pearce, David; Penton, Annelise (2002). "The Imperial War Museum, London – Stage 3" (PDF). The Arup Journal. Arup. 37 (2): 42–47. Archived from the original (PDF) on 3 June 2013. Retrieved 25 March 2012. ^ Hansard, 17 July 1989 Imperial War Museum – HC Deb 17 July 1989 vol 157 cc13-4 Hansard 1803 –2005. Retrieved 16 March 2009. ^ Kirby, Terry (18 September 1992). "Firebombs found at three tourist venues in London". The Independent. Retrieved 6 April 2009. ^ Hansard, 4 March 1996 Terrorist Incidents – HC Deb 4 March 1996 vol 273 cc51-62W Hansard 1803–2005. Retrieved 6 April 2009. ^ For details of the development process of the Holocaust Exhibition see Bardgett, Suzanne (June 2000). "Exhibiting Hatred". History Today. 50 (6): 18–21. ISSN 0018-2753. .
^ Morris Hargreaves Mcintyre (27 October 2006). "Evaluation of the Veterans Reunited Programme" (PDF). Manchester. pp. 5–6. Retrieved 2 March 2011. ^ Morris Hargreaves Mcintyre (27 October 2006). "Evaluation of the Veterans Reunited Programme" (PDF). Manchester. p. 51. Retrieved 2 March 2011. ^ Morris Hargreaves Mcintyre (27 October 2006). "Evaluation of the Veterans Reunited Programme" (PDF). Manchester. p. 77. Retrieved 2 March 2011. ^ Morris Hargreaves Mcintyre (18 March 2010). "You can't ask a textbook a question: An evaluation of The Immersive Learning Programme, Their Past Your Future 2, Imperial War Museum" (PDF). Manchester. pp. 4–5. Retrieved 2 March 2011. ^ University of London Computer Centre. "TPFY Digital Archive". Retrieved 2 March 2011. ^ Imperial War Museum. "Their Past Your Future: Learning Resources for Teaching History". Retrieved 2 March 2011. ^ Imperial War Museum (3 October 2011). "IWM Launches New Brand" (PDF). iwm.org.uk. Retrieved 6 March 2012. ^ NESTA (26 September 2011). "Eight finalists chosen to pioneer digital R&D projects". Retrieved 14 April 2012. ^ Audas, Jane (13 April 2012). "Innovation in arts and culture #2: the Social Interpretation project at IWM". The Guardian. Retrieved 14 April 2012. ^ Clarence House (9 December 2010). "Prince William to become Patron of the Imperial War Museum Foundation's First World War Centenary Appeal". Retrieved 9 December 2010. ^ "Plans to mark World War I centenary announced". number10.gov.uk. HM Government. 11 October 2012. Retrieved 12 October 2012. ^ Imperial War Museum (2013). "Transforming IWM London". iwm.org.uk. Archived from the original on 6 September 2013. Retrieved 15 September 2013. ^ "Foster + Partners adds First World War galleries to London's Imperial War Museum". Dezeen. 2014. Retrieved 6 December 2014. ^ "Listings - IWM London: October, November and December 2012 [press release]" (PDF). IWM. 25 September 2012. Retrieved 15 September 2013. ^ "Battle of Britain Spitfire set to leave IWM London before museum temporarily closes for six months from 2 January – July 2013 [press release]" (PDF). IWM. 13 December 2012. Retrieved 15 September 2013. ^ "IWM London partially re-opens [press release]" (PDF). IWM. 29 July 2013. Retrieved 15 September 2013. ^ English, Rebecca (17 July 2014). "Prince William and David Cameron officially open Imperial War Museum's new First World War galleries as visits begin following £40m refurbishment". Daily Mail. Retrieved 18 July 2014. ^ Wingate, John (2004). In Trust for the Nation: HMS Belfast 1939–1972. London: Imperial War Museum. p. Postscript. ISBN 1-901623-72-6. ^ a b Darlington, Ida, ed. (1955). "Bethlem Hospital (Imperial War Museum)". Survey of London: volume 25: St George's Fields (The parishes of St. George the Martyr Southwark and St. Mary Newington). British History Online. pp. 76–80. Retrieved 29 January 2012. ^ Historic England. "Imperial War Museum (1385640)". National Heritage List for England. Retrieved 8 January 2012. ^ Heritage Lottery Fund – Second World War 60 Years On: remembering, learning, commemorating Archived 25 March 2009 at the Wayback Machine Accessed 10 March 2009. ^ Imperial War Museum (2009) Imperial War Museum London map Accessed 12 April 2010. ^ Moss, Richard (9 November 2010). "Extraordinary stories revealed as the Imperial War Museum opens The Lord Ashcroft Gallery". Culture24. Retrieved 12 November 2010. ^ Archives in London and the M25 Area All Saints Hospital. Retrieved 20 August 2009. ^ Lost Hospitals of London. Retrieved 14 April 2010. ^ For a list of aircraft, vehicles and boats at Duxford, see "IWM Duxford: Aircraft and Vehicles" (PDF). Imperial War Museum. November 2011. Retrieved 2 February 2012. ^ Imperial War Museum Duxford (2009) Historic Duxford Archived 1 October 2009 at the Wayback Machine. Retrieved 15 September 2009. ^ "HMS "Belfast" (Hansard, 19 January 1978)". hansard.millbanksystems.com. Retrieved 21 August 2009. ^ Kennedy, Maev (9 April 2003) The Guardian Restored underground apartments opened to public. Retrieved 28 July 2009. ^ "Peel Holdings milestones". Manchester Evening News. 3 February 2005. Retrieved 28 January 2012. ^ Herbert, Ian (3 July 2002) The Independent Libeskind's war museum triumphs over cost-cutters. Retrieved 9 October 2009. ^ Hughes, Matthew (Winter 2002) Institute of Historical Research: History in Focus The Imperial War Museum (North): The Triumph of Style over Substance?. Retrieved 9 October 2009. ^ Worsley, Giles (29 June 2002) The Daily Telegraph A globe ripped to pieces. Retrieved 20 November 2009. ^ Imperial War Museum Photograph no. E 18980, Montgomery's Grant tank, office caravan, bedroom caravan, map caravan and staff car. Imperial War Museum Collections Search. Retrieved 28 January 2012. ^ The National Archives (2012). "Montgomery, Bernard Law (1887–1976) 1st Viscount Montgomery, Field Marshal". National Register of Archives: Person details: Archive details. Retrieved 26 January 2012. ^ Imperial War Museum (2012). "Private Papers of Field Marshal Sir John French". Imperial War Museum Collections Search. Retrieved 25 February 2012. ^ Richards, Anthony (2004). "Archive Report: The Department of Documents at the Imperial War Museum". Contemporary British History. Routledge. 18 (2): 103–112. doi:10.1080/1361946042000227751. ^ Imperial War Museum (2012). "About the Collections: Documents". iwm.org.uk. Retrieved 11 August 2012. ^ a b c d e f g h Imperial War Museum (2012). Imperial War Museum Annual Report and Account 2011–2012 (PDF). London: The Stationery Office. p. 62. ISBN 9780102976571. Retrieved 11 August 2012. ^ a b Imperial War Museum (2012). "About the Collections: Art and Popular Design". iwm.org.uk. Retrieved 11 August 2012. ^ Malvern, Sue (Spring 2000). "War, Memory and Museums: Art and Artefact in the Imperial War Museum'". History Workshop Journal. Oxford University Press. 49: 177–203. doi:10.1093/hwj/2000.49.177. JSTOR 4289665. ^ "Gassed (Art.IWM ART 1460)". Imperial War Museum Collection Search. Retrieved 11 August 2012. ^ "The Hall of Remembrance". The Imperial War Museum. Retrieved 2 June 2014. ^ Foss, Brian (1991). "Message and Medium: Government Patronage, National Identity and National Culture in British 1939–1945". Oxford Art Journal. Oxford University Press. 14 (2): 52–72 . doi:10.1093/oxartj/14.2.52. ISSN 0142-6540. JSTOR 1360524. ^ Imperial War Museum. "Contemporary War Artists: Introduction". archive.iwm.org.uk. Retrieved 25 February 2012. ^ Imperial War Museum. "Falklands War 1982, Linda Kitson's artistic record". archive.iwm.org.uk. Retrieved 11 August 2012. ^ Imperial War Museum. "Gulf War 1991, John Keane's artistic record". archive.iwm.org.uk. Retrieved 11 August 2012. ^ "Cleansed, 1994 (Art.IWM ART 16521)". Imperial War Museum Collection Search. Retrieved 11 August 2012. ^ The Art Fund. "Queen and Country: A project by Steve McQueen". www.artfund.org. Archived from the original on 5 August 2012. Retrieved 11 August 2012. ^ Langlands & Bell. "The House of Osama bin Laden". www.langlandsandbell.com. Archived from the original on 2 May 2012. Retrieved 11 August 2012. ^ Visual Arts Data Service (2008). "Imperial War Museum: Concise Art Collection". ; "Imperial War Museum: Posters of Conflict". ; "Imperial War Museum: Spanish Civil War Poster Collection". University for the Creative Arts. Retrieved 11 August 2012. ^ "Google Art Project: Imperial War Museums". Google Art Project. 2012. Retrieved 6 May 2012. ^ 'The world’s first specialist—or non-fiction—film archive...is recognised as that of the Imperial War Museum'; editor's note in Trujillo, Iván (October 2003). Daudelin, Robert (ed.). "2003 FIAF Award to Ingmar Bergman" (PDF). Journal of Film Preservation. Fédération Internationale des Archives du Film – FIAF. 66: 33. ISSN 1609-2694. Archived from the original (PDF) on 25 July 2011. Retrieved 22 December 2010. ^ '...perhaps the strongest claimant to being the first authentic, authorized film archive is Britain’s Imperial War Museum' in Jeavons, Clyde (April 2007). Daudelin, Robert (ed.). "The Moving Image: Subject or Object?" (PDF). Journal of Film Preservation. Fédération Internationale des Archives du Film – FIAF. 66: 25. ISSN 1609-2694. Archived from the original (PDF) on 25 July 2011. Retrieved 22 December 2010. ^ For the early history of the Imperial War Museum film archive, see Smither, Roger; Walsh, David (2000). "Unknown Pioneer: Edward Foxen Cooper and the Imperial War Museum Film Archive 1919–1934". Film History. Indiana University Press. 12 (2): 187–203. ISSN 0892-2160. JSTOR 3815371. ^ Der Magische Gürtel (film) (2000 restoration ed.). Europa Film Treasures. Archived from the original on 30 November 2009. ^ Haggith, Toby (2002). "D-Day Filming: For Real. A Comparison of 'Truth' and 'Reality' in "Saving Private Ryan" and Combat Film by the British Army's Film and Photographic Unit". Film History. Indiana University Press. 14 (3/4): 332–353. doi:10.2979/fil.2002.14.3-4.332. JSTOR 3815436. ^ Caven, Hannah (2001). "Horror in Our Time: Images of the concentration camps in the British media, 1945". Historical Journal of Film, Radio and Television. Routledge. 21 (3): 205–253. doi:10.1080/01439680120069399. ^ "Imperial War Museum Film Archive". Moving History: A guide to UK film and television archive in the public sector. Arts and Humanities Research Board. Archived from the original on 22 February 2012. Retrieved 12 August 2012. ^ "Collection search for "e brooks"". Collection Search. Imperial War Museum. Retrieved 28 August 2012. ^ "Collection search for "j w brooke"". Collection Search. Imperial War Museum. Retrieved 28 August 2012. ^ Hudson, Alex (2 November 2012). "Flower beds that meant death for German WWI soldiers". BBC News. Retrieved 8 September 2012. ^ "The National Collection of Aerial Photography: Links". aerial.rcahms.gov.uk. Royal Commission on the Ancient and Historical Monuments of Scotland. Retrieved 8 September 2012. ^ "Collection search for "bert hardy"". Collection Search. Imperial War Museum. Retrieved 28 August 2012. ^ "Flag, Red Ensign, Canadian". Collection Search. Imperial War Museum. Archived from the original on 30 April 2013. Retrieved 25 August 2012. ^ "Flag, National, British, Union flag". Collection Search. Imperial War Museum. Retrieved 25 August 2012. ^ "Union flag". Collection Search. Imperial War Museum. Retrieved 25 August 2012. ^ "Trench Art". Collections in Context. Imperial War Museum. Retrieved 26 August 2012. ^ "Collections Search for "trench art"". Collection Search. Imperial War Museum. Retrieved 26 August 2012. ^ "Collections Search for "trench club"". Collection Search. Imperial War Museum. Retrieved 26 August 2012. ^ "Rifle, Short, Magazine, Lee Enfield, .303 inch, Mk 3". Collection Search. Imperial War Museum. Retrieved 26 August 2012. ^ "Colt Government Model (civilian, 1911)". Collection Search. Imperial War Museum. Retrieved 26 February 2012. ^ "QF 13 pdr Mk 1 (Néry Gun)". Collection Search. Imperial War Museum. Retrieved 26 August 2012. ^ "AEC B Type Bus (B43 Old Bill)". Collection Search. Imperial War Museum. Retrieved 18 February 2012. ^ "Collection Search for "montgomery" (vehicles, aircraft and ships)". Collection Search. Imperial War Museum. Retrieved 26 August 2012. ^ Parsons, Gary (2005) 'TSR2 cubed' AirSceneUK.org.uk. Accessed 28 September 2009. ^ "ship, Coastal Motor Boat (CMB 4) – MAR 563". Collections Search. Imperial War Museum. Retrieved 26 August 2012. ^ "Submersible, Midget Submarine XE8, British". Collections Search. Imperial War Museum. Retrieved 26 August 2012. ^ a b "Imperial War Museum Collections". copac.ac.uk. University of Manchester. Retrieved 8 September 2012. ^ British Library. "The Imperial War Museum's Stamp Collection". Help for Researchers: Philatelic Collections: General Collections. Retrieved 3 October 2012. ^ Imperial War Museum (2012). "About the Collections: Sound". iwm.org.uk. Retrieved 23 September 2012. ^ Lance, David (October 1977). "Sound Archive of Recordings Opens to the Public". Social History. 2 (6): 803–804. doi:10.1080/03071027708567412. JSTOR 4284738. ^ Peter Naughton (20 October 2012). "Podcast and Internet Radio previews: Voices of the First World War and Here's the Thing". telegraph.co.uk. Retrieved 16 November 2012. ^ "War Memorials Register". Imperial War Museum. Retrieved 9 January 2018. ^ "UK War Memorials Register". The Great War 1914-1918. Retrieved 9 January 2018. ^ "Lives of the First World War launch - February 2014". The Great War Forum. 8 November 2013. Retrieved 20 March 2019. ^ "IWM & brightsolid partner to create Lives of the First World War digital memorial - Family Tree". family-tree.co.uk. Archived from the original on 7 December 2014. Retrieved 9 January 2018. ^ "Knowledge Base - Help and Support for Lives of the First World War". support.livesofthefirstworldwar.org. Retrieved 9 January 2018. ^ "How long will the site be available for?". support.livesofthefirstworldwar.org. Archived from the original on 18 August 2015. Retrieved 9 January 2018. IWM has made a commitment that Lives of the First World War will be an interactive platform available to the public throughout the four years of the centenary, and that the permanent digital memorial will be saved for future generations. ^ "How long will the site be available for?". support.livesofthefirstworldwar.org. Retrieved 31 March 2017. From early 2019 the memorial will become part of IWM’s archive, and will be free to access [online] for research. ^ Office of Public Sector Information Revised Statute from The UK Statute Law Database: Imperial War Museum Act 1955 (c.14). Retrieved 14 April 2010. ^ Imperial War Museum (2012) Our Trustees: Trustee Profiles. Retrieved 6 January 2012. ^ Imperial War Museum (September 2006) Imperial War Museum Corporate Governance Code. Retrieved 14 April 2010. ^ Perowne, B C. "Martin, Sir Douglas Eric Holland- (1906–1977)". Oxford Dictionary of National Biography. Oxford University Press. Retrieved 15 July 2010. ^ Brock, P W. "Sir Algernon Usborne Willis (1889–1976)". Oxford Dictionary of National Biography. Oxford University Press. Retrieved 15 July 2010. ^ Probert, Henry A. "Grandy, Sir John (1913–2004)". Oxford Dictionary of National Biography. Oxford University Press. Retrieved 15 July 2010. ^ Barrass, M B (2001–2008). "Marshal of the RAF Sir John Grandy (32078)". Air of Authority – A History of RAF Organisation. Retrieved 15 July 2010.